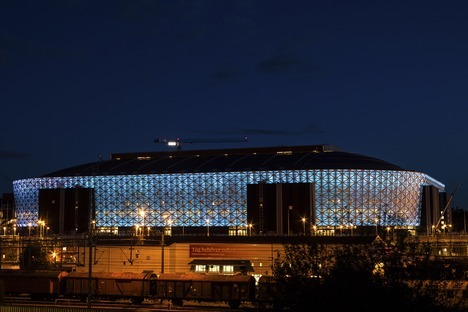 Sweden’s national stadium designed by Berg, C. F. Møller and Krook & Tjade is a high-tech, environmentally friendly structure enclosed in a façade made up of sheets of micro-perforated embossed aluminium. Stockholm’s Friends Arena, with a capacity of 50,000 spectators for sporting events and 65,000 for other events, is considered a fifth generation stadium thanks to its numerous high-tech solutions. First of all, the choice of HSS rapid steel for the structures, which saved 17% on the amount of material used, while LED lights are installed everywhere to save energy and prevent attraction of lightning. Wastes are collected for recycling at the end of each event, while food wastes are transformed into biogas. In addition to this, to save energy, the majority of the technological systems are automated, starting with those controlling the lighting, which have motion detectors so that they will switch on and off. Warmth from wastewater throughout the stadium is exploited via a heat exchanger, combined with heating from the local district heating scheme. All this would be in vain in a stadium if the opening of the external doors were not accelerated to reduce dispersion of the indoor temperature and guarantee sustainable, efficient overall energy use. The roof consists of a grid of big girders topped by an ultralight multi-layered covering only 3 feet (91 cm) thick, which slides over it, closing or opening all the way in about 20 minutes. 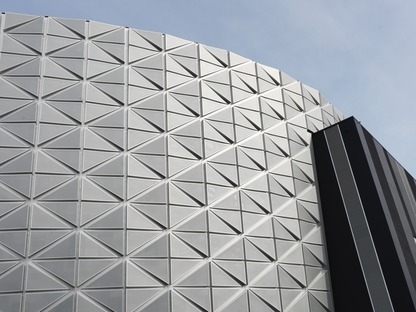 The façade is made of triangular embossed aluminium panels which conceal lighting that changes colour to suit the event taking place in the stadium.